Kategorie 5 kabel, (ook: Cat5 / Cat5e), is 'n gedraaide draadpaarkabel wat ontwerp is om 'n hoë mate van integriteit in elektriese seine te verseker. Baie sulke kabels is onafgeskerm maar kan ook soms met 'n afskermingskede voorsien word. Die Kategorie 5 spesifikasie is vervang met die Kategorie 5e spesifikasie. Hierdie soort kabel word dikwels gebruik in kabels vir rekenaarnetwerke soos Ethernet en word ook gebruik om baie ander seine te dra soos vir basiese telefoniese dienste. Beeld van 'n gedeltelik gestroopde kabel waardeur die gedraaide draadpare sigbaar word. Die oorspronklike spesifikasie vir kategorie 5 cable was in ANSI/TIA/EIA-568-A gespesifiseer, met klassifikaasie in TSB-95. Hierdie dokumente spesifiseer die dienslewering-karakteristieke en toets-benodighede vir frekwensies tot 100 MHz. Kategrie 5 kabels sluit vier gedraaide draadpare in 'n enkele kabelomhulsel in. This use of balanced lines helps preserve a high signal-to-noise ratio despite interference from both external sources and other pairs (this latter form of interference is called crosstalk). It is most commonly used for 100 Mbps networks, such as 100BASE-TX Ethernet, although IEEE 802.3ab defines standards for 1000BASE-T - Gigabit Ethernet over category 5 cable. Cat 5 cable typically has three twists per inch of each twisted pair of 24 gauge copper wires within the cable. Cat 5e cable is an enhanced version of Cat 5 that adds specifications for far end crosstalk. It was formally defined in 2001 in the TIA/EIA-568-B standard, which no longer recognizes the original Cat 5 specification. Although 1000BASE-T was designed for use with Cat 5 cable, the tighter specifications associated with Cat 5e cable and connectors make it an excellent choice for use with 1000BASE-T. 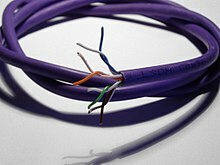 Despite the stricter performance specifications, Cat 5e cable does not enable longer cable distances for Ethernet networks: cables are still limited to a maximum of 100m (328ft) in length (normal practice is to limit fixed ("horizontal") cables to 90m to allow for up to 5m of patch cable at each end). Cat 5e cable performance characteristics and test methods are defined in TIA/EIA-568-B.2-2001. Usually, solid core cable is used for connecting the wall socket to the socket in the patch panel, and stranded cable is used for the patch leads between hub/switch and patch panel socket and between wall port and computer. Cable types, connector types and cabling topologies are defined by TIA/EIA-568-B. 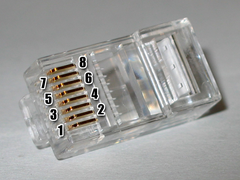 Nearly always, 8P8C modular connectors, often incorrectly referred to as " RJ-45", are used for connecting category 5 cable. Cable your own house - written in 1999 and does have some out of date information. Die bladsy is laas op 19 April 2017 om 11:51 bygewerk.